My cousin John recently posted a link to an article about a website called “The 53” that has cropped up in response to the “Occupy Wall Street” protests that are going on lately. The protestors say they are representing 99% of Americans opposed to everything from the war, corporate greed, capitalism and free enterprise, all while national unemployment averages are in the 9% range. Yes, these are all issues of importance to Americans, agreed. The number 53 represents the estimated 53% of Americans whose income taxes are paying for themselves and supporting the rest of the country as well. I tend to think of them as the “majority shareholders” in the United States of America. They’re the ones who are footing the bill for every government agency, every social program and every handout and I’m not just talking about the Obama administration. The middle class have borne the brunt of things for quite a long time now. As I write this, all over the country, these outdoor park “sit-ins” are going on in major cities, including my own state capital, Atlanta. They have the right to do that and I respect that right completely but what I hear on the news is that they are mostly unorganized; that their demands are not cohesive enough to properly address what they want to be done to make things right with them and that many of them are just there because it’s exciting and it’s something to do. Besides look for a job or go serve their country or work towards bettering their community I should add. What I see are images of mostly younger people, unemployed or in college, protesting a range of problems without offering any solutions. Many have never worked before but someone, likely their parents, have made it possible for them to complain about being unable to find jobs while writing their laments on their expensive laptops and iPhones. When one was asked in an interview why they were there instead of looking for a job, their response was that this was more important than knocking on doors. That tells me that to many of the protestors, it isn’t about the cause or even addressing the cause; it’s about the opportunity to be a part of the protest itself. I don’t know about my readers but honestly, if I was out of a job and all my competition for jobs was in a park protesting, I’d be taking advantage of their absence. I think an employer is more likely to hire someone that is standing in their doorway asking for a job than someone who is over in the park protesting. 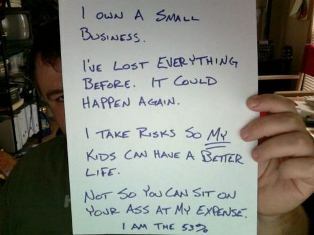 If you go to the website of “The 53” (http://the53.tumblr.com/) you will find an inspiring collection of stories from average, everyday Americans who aren’t sitting around complaining about everything. They are working, some of them 2 and 3 jobs, to put food on their table, support their families and pay their taxes into a system that turns around and gives a lot of their hard-earned cash to others (many of whom are camping out in parks around the country and loudly protesting the economic engines that provide jobs and puts money into the system in the first place). If the 53% are angry, it’s not because they aren’t being given something but that those who are given something is speaking out for them on views that don’t necessarily reflect what they think or feel. 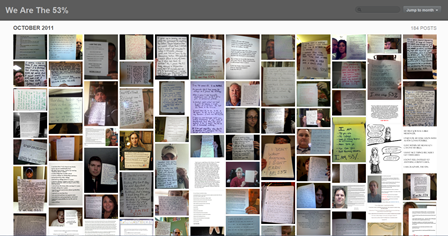 In a sense, “The 53” are protesting the protestors and they are doing so by writing their viewpoint on a piece of paper and posting a picture of it, which the website then picks up and posts as it can. I was born in the 1960’s while America was fighting a war in Vietnam. My father worked hard managing a family owned restaurant to support his family. For many years, I usually saw him only at suppertime as he worked seven days a week and 12+ hours a day. He rarely got to go to church but he urged us to go. He worked hard so my mother would not have to work outside of the home and could stay there and raise my brother and me. She took care of us, saw to our daily needs, cooked our meals, entertained us, took us to church, helped us with our homework and kept the books for the business. 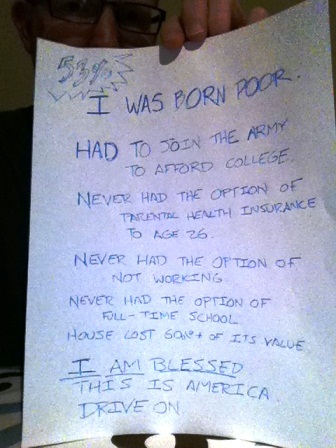 My parents gave me opportunities many Americans don’t have. I never had to go without food, clothing, medical care or shelter. They worked hard and never put their parental responsibilities off on others to do it for them. It wasn’t the way they were raised. We had toys to play with, usually given at Christmas and Birthdays. Any other time was an unexpected treat. My first car was seven years old when it was given to me for my 16th birthday. I had to work and earn the money to put gas in it or it stayed parked. I graduated from high school and was given the opportunity to attend college by my parents. I volunteered my time to my community as a volunteer firefighter when we only had one paid firefighter. I attended the area technical college to become an EMT and worked two jobs after becoming certified to make ends meet. I helped save lives and even brought a few children into the world when I worked on an ambulance. My work brought me into contact with many people less fortunate than I was. I saw people living in conditions I could not imagine myself living in. Some worked hard but could not get ahead no matter what they did. Others did nothing and received help which did nothing to help their living condition. You could tell one from the other despite their similar living conditions. The ones who struggled and worked took pride in what little they had. The ones who didn’t, didn’t. When my career progressed, other opportunities to serve my community became available. My community gave back to me far more than I could ever give to it. I had a job to support me and role models to look up to. I found a wife that was supportive of me and whose parents raised her to have the same work ethics and values that I had been given. Together, we were blessed with a son who we try to instill with those same values. We work hard to support our family and to pay our taxes into a system that rewards some who do very little but live off the work of others. I work for a local government. We don’t have social programs. We receive money from hardworking citizens and use that to provide direct services back to them. We rarely make everyone happy but we try to do the best job we can and sometimes we make a big difference to someone in a positive way. I serve on and chair the board of directors of the same technical college I attended many years ago and I take pride when I hear the stories our graduates tell of the hardships they have overcome to receive a college degree or certificate that will enable them to support their families and to be productive members of society. They will soon be a part of the 53 and their stories and passion to work inspire me. I am the 53. God bless America. All images in this post are from the website of The 53 listed above. Thank you for reading it and your comment!